Dwight D. Eisenhower, thirty-fourth president of the U.S., thought that we should devote attention and time to our activities in accordance with their importance and urgency. He said, rightly, that we are too inclined to focus on the things that are both important and urgent, generating a reactive behavior based on what has to be done right now, instead of focusing on the things that are important and not urgent, which would be the basis of a more strategic behavior based on long-term goals. Stephen R. Covey popularized the Eisenhower’s Time Management Matrix in his book The 7 Habits of Highly Effective People, stating that we live a fourth generation of time management, more effective, in which managing time itself is no longer the aim, but managing where to focus at any particular time. Something is urgent when it requires immediate attention. Urgent stuff catch your attention and pressure you. The trap is that many of them are easy, or funny, or popular, but they are unimportant. Something is Important when it contributes to your medium and long term goals, to your life purpose. You need to be proactive not to neglect the activities that are important but not urgent, since they will not demand your attention. If you ignore them, they eventually will become urgent, and this behavior will lead you to a vicious circle involving living always in reactive mode, in a continuous crisis. If you pay too much attention to Quadrant I (urgent and important things), it will become increasingly larger and will dominate your life completely. 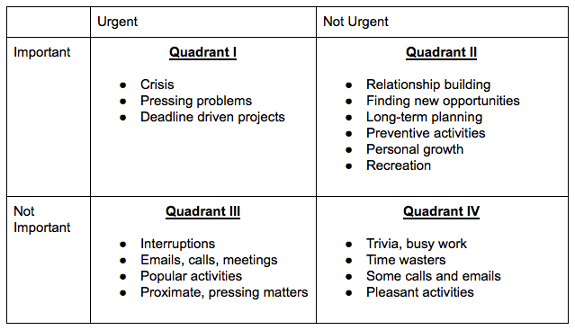 Quadrants III and IV include things that, urgent or not, do not matter. Effective people spend more time in Quadrant II, minimize the time spent in Quadrant I, and do not worry too much about Quadrants III and IV. In Quadrant II (important, but not urgent things) lies the heart of effective personal management. Here are the things that allow you to live and act preventively, seizing opportunities rather than solving problems. Things like creating and reinforcing personal relationships, exercising, long-range planning, learning, etc. 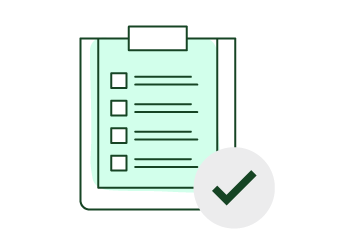 To move toward this quadrant, you must first be clear about what your priorities are, and then you must learn to say no to other activities, some of them urgent and apparently important.